Smaller growing Silver Spear that forms spreading colonies in part shade, rich soil and a protected location. Red tinted silver arching evergreen perennial that requires protection form hot dry conditions in summer and subfreezing winds in winter. To 8″ tall and twice as wide. Excellent in containers, protect containers from temperatures below 20ºF. This has been a long term performer in protected urban environments. Cover if temperatures threaten to drop below the upper teens. Added protection can’t hurt. Regular summer water speeds the increase of the clump. Handsome plant. Try it in a protected woodland- you’ll like it. Trust me. Heh. Wonderful performance at the Oregon Coast. Much hardier to cold but quite a bit smaller this Astelia has thrived in Portland gardens for years. Part shade and rich, moisture retentive soil that drains well is ideal. It seems to adore unamended loam as well. 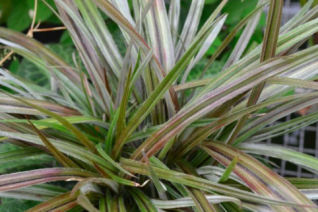 Rosette forming monocot with silver leaves that have a distinct red tint. Avoid blasting hot dry situations- this species hates that. Spreads slowly to form showy evergreen patches. Mix in borders, among shrubs- which adds winter protection or in containers. Protect containers from temperatures below 20ºF. In the ground it is hardy in to the low teens. With a little added extra protection- remay, leaves, even a dry towel during arctic events and it it will take lower. Little spikes of green flowers occasionally transfer into bright orange fruits. To 1′ x 1′ slowly. Regular summer water. Silver Spear. 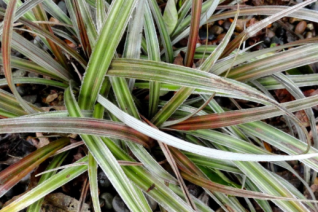 Dramatic silver green monocot spikey plant that we adore for container culture. 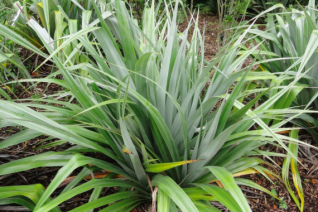 To 3′ tall and dense the rosettes produce long silvery spiky leaves at a moderate pace. Full sun to light shade in rich, well drained soil. Not completely hardy in Portland, it freezes out at about 18ºF- and containers should be protected over the winter- move into an unheated place. Rich, soil, regular irrigation which speeds growth. In the ground you must choose the most protected urban site possible. Then mulch and cover with an opaque sheeting when temperatures threaten to dip below 20ºF. In town that is about once every four years. It can freeze back quite a way but recovery is dubious and slow at best. Excellent performance at the Oregon Coast where it is a permanent landscape plant.